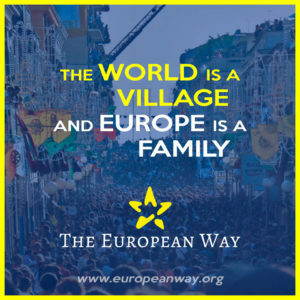 What is The European Way? We are an open and independent network of volunteers pursuing democracy, freedom, and solidarity. We are aware of the potential of digital connection for a ‘grassroot’ movement in Europe. We envision a nonviolent civil movement to overcome the borders existing between people and societies and adopt a holistic approach through offline and online activism. We reach for the foundation of a federal Republic on the grounds of our European identity and our shared values. Our objective is to build a sense of unity and common purpose among Europeans from different regions, cultures, and social backgrounds. We are driven by our European identity and pursue democracy not bound by national chains. While the universal values of democracy and human rights are the real foundation of good life, today’s dominant political alternative available to the is founded on a narrative of violence and nationalism. We want to raise public awareness for the common identity through our work, thus implementing a European ‘can do’ attitude. We aim to foster constructive debate and integration by reintroducing the positive emotions and connotations of ‘Europe’ into everyday life. If you don’t agree with the status quo or the alternatives available, from now on you can choose The European Way. Our goal is to enable self-sustainable European Circles in major cities offering a platform for local activists, while our network provides efficient communication and coordination. The first two European Circles are soon to be founded in Berlin and Bologna. We are planning a European activist congress and a Union wide action day in the foreseeable future to raise public awareness and to unite the democratic front against nationalism. Content production – We will soon publish further position papers, videos, interviews, ecards, print materials and other articles. To overcome linguistic borders we aim to translate our work into as many languages as possible. Since the idea of nonviolence and the overcoming of borders embraces all fields of human activity and interest, every constructive voice is needed. You can be part of the network, if you want to contribute to the idea. We search for thinkers, dreamers, bloggers, translators, designers, artists, programmers and many more. Campaigning – In order to spread the message and constructive means of communication we foster the accessibility to information. It is necessary to raise awareness with all available means. Campaigning for the European identity means to address the walls standing in the way of nonviolent solutions. You can easily access the materials we have produced, as we offer them for free and invite you to use the material and to be part of the change. Community action – Political change for the better can happen, when the civil society is enlightened and determined to succeed. The European Circles are dedicated to activities able to involve uninterested and disaffected people. Each Circle cooperates with local partners and develops individual approaches adaptive to the local environment, while the European Way network ensures coordinated action and the diffusion of ideas. Please contact us, if you want to know more on how to organize your local European Circle and stay tuned for more about the other Circles are growing. History is repeating itself, people are being dehumanized and harassed once more. We are in the middle of a vicious circle of egoism and fear. If we do not change, the way we think and act now, violence will prevail and walls will kill the European vision of peace and respect. Don’t wait any longer for somebody else to fix this mess. Stand in for your values and fight for a free, democratic and solidary Europe!